We’re not just one company—we’re many. We’re a family of many of the industry’s top, most well-known RV companies. We started small in 1980 with just one towable RV company under our name. And slowly we grew to become one of the world’s largest RV manufacturers. But it’s more than just strength in numbers; it’s strength in quality. We’ve grown through being selective, through finding those who pioneer, who deliver on their promises, and who make the best products and the best experiences. We choose the best, so when you go to choose the RV that’s right for you, it’s that much easier to make your decision with confidence. Where can I camp in my RV? 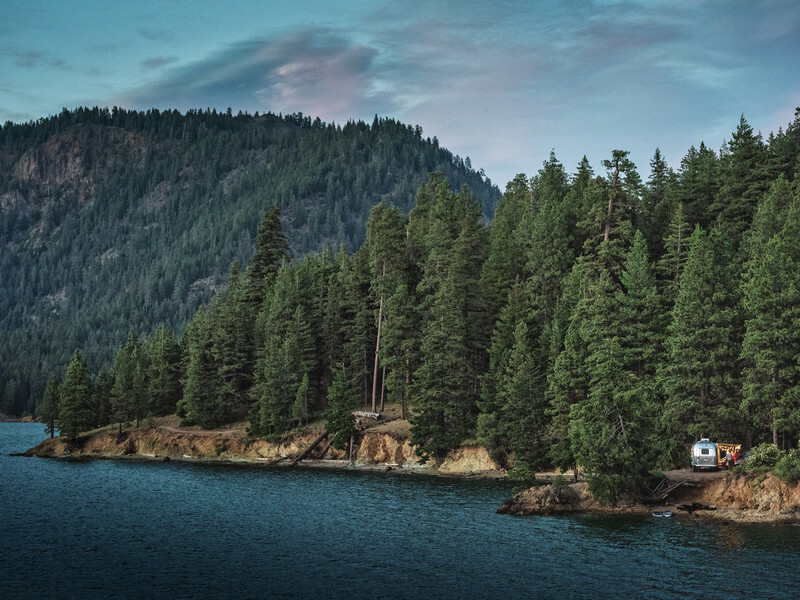 With an estimated 27,000 public and private campgrounds in the United States and Canada, there is no shortage of great places to explore in your RV. Not surprisingly, many campgrounds are located near some of the most spectacular scenery in North America. On the other hand, you can often find a campground within a short drive from home making weekend get-a-ways fun and easy. I’m interested in a travel trailer. How big a trailer can my car or truck tow? There are many variables that determine your vehicle’s towing capacity. Fact is that two seemingly identical cars or trucks may have different tow ratings depending on powertrain, differential-ratio, brakes, cooling system and other factors. Your auto dealer is a primary resource to help you figure this out and oftentimes can provide details simply by entering your vehicle identification number(VIN) into their service computer. One handy on-line resource is the Trailer Life Towing Guide, which includes vehicle tow ratings for the past 20 years. Another source of guidance is your RV dealer who can help set you up with the proper towing hardware, hitch system and brake controller. “RV” stands for recreational vehicle and is also commonly referred to as a camper or caravan. Most RVs are self-contained and equipped with living accommodations like a bed, running water, bathroom, stove, and refrigerator. What are the different kinds of RVs? In general, there are two kinds of RVs—Trailers which are towed behind a car or truck and Motorhomes which are self-propelled and driven. Learn more in the RV Type section of our website. Thor’s family of companies offers an incredible range of products making it possible for almost anyone to start camping in a new RV. Prices start at around $12,000 for an easy to tow, ultra-lite travel trailers and increases as you add space and luxury features. You will find literally hundreds of choices to fit your family and budget. Where and how do I buy an RV? RVs are sold through local RV dealerships and the purchase process is similar to the way in which you would buy a car. Thor operates an established network of authorized dealers to help you select the right RV for your needs, secure financing, and maintain your RV for optimum enjoyment in the years ahead. I see RVs described as self-contained. What does that mean? RVs manufactured by Thor companies are “self-contained” which means they provide the basic necessities needed for several days without external electrical, water, or sewer connections. Frequently this includes toilet facilities, fresh water storage, waste holding tanks, refrigerator, stove, furnace for heat, and 12-volt storage battery. With a self-contained RV you can camp without the need to be plugged in. How does the RV electrical system work? The RV electrical system actually consists of a 12-volt automotive-type system anda 115-volt AC household-type system. Most lights, appliances, and electrical motors operate on 12-volt, which makes it possible to camp comfortably without plugging into an external power supply. When you are plugged in or running off a generator, the power is used to charge the 12-volt batteries and high-demand appliances like the air-conditioner and microwave oven. How do generators work and do I need one in my RV? An electrical generator transforms mechanical force into electrical current through a process called electromagnetic induction. In plain English, an internal combustion engine rotates a shaft that generates electricity using an armature and stator. Generators are powered by gasoline, liquid propane, or diesel fuel. Most functions in your RV do not require a generator. Lights, pumps, your RV refrigerator, furnace, and most electric motors, operate on 12-volt DC power through your house battery. Certain appliances like your RV air conditioner, microwave oven, and most televisions do require a generator or external power connection to operate. If you plan to camp for an extended period with no exterior power source (think days), a built-in or portable generator will be useful to charge your RV’s house battery/s. Solar panels are also an alternative to a generator for this purpose. What types of holding tanks are on RV's? Your RV is equipped with storage tanks to hold three types of water. First is fresh water used for drinking, cooking, showers and flushing the toilet. A second type is the waste water you used to shower or wash dishes, commonly called gray water. The third, referred to as black water, is the waste water from the toilet. Maintenance of your tanks is essential. You should always empty your tanks at a proper dump station. These can found at most campgrounds, some highway rest stops, and at many other locations including truck stops. To keep your black and gray tanks functioning correctly, we recommend emptying the tanks when they are at least 2/3rds full. The added force of a full tank of water helps to flushaway any solids that might collect in the bottom of your tank reducing holding capacity and fouling tank monitoring sensors. Your fresh water tank should be sanitized regularly following the instructions in your RV’s owner’s manual. Can I use my RV refrigerator even when I’m not plugged into a power source? Short answer is YES. Most likely your RV is equipped with an RV refrigerator. RV refrigerators are absorption refrigerators and operate on household current or propane. When the camper is not plugged into an AC power source, the refrigerator uses heat from a propane-fueled flame to complete the cooling process. Some RVs now offer residential refrigerators like those you have in your home. These refrigerators use the RV’s battery power supply, inverted into AC power, to operate the refrigerator compressor and supply cooling when not plugged into an external power source. What kind of gas mileage will I get with my RV? That’s impossible to answer since it depends on so many variables like weight, speed, traffic, terrain and your driving style. Safe to say that when towing a camper or driving a motorhome you will get less MPG than you do on your everyday commute to work. Please keep in mind that the typical RV family drives less than 5000 miles a year with their camper, so fuel consumption is not a major budget consideration. I see the term “GVWR” all the time when researching RVs. What does it mean? GVWR stands for Gross Vehicle Weight Rating and is the maximum permissible weight of the vehicle or trailer when fully loaded for travel and includes the vehicle empty weight, all fluids, cargo, added equipment and occupants. For safety and handling it is important not to exceed your trailer or motorhome’s GVWR. You can find the GVWR of your tow vehicle, trailer, or motorhome on a sticker located on the inside of your driver’s door, near the exterior roadside front of the trailer, or on the entry door. Can I finance my RV like a home or car? You can finance your RV. Since an RV is both a house and a car, lending criteria is a bit different. On average, RV loans range from 10-15 years with interest rates depending on size of loan, length of loan, down payment and your credit rating. Your RV dealer can offer you financing options as can your local bank or credit union. I’ve lost my RV keys, how do I get a replacement? You can order replacement keys for your RV entry door, storage bays, and external compartments from an RV dealer. Many times, a locksmith can provide replacement keys if they have access to your RV. Since most local hardware stores do not usually carry RV key blanks, consider making a duplicate set and keeping it accessible. Do RVs have hot and cold water? Almost all RVs have hot and cold water for drinking, showering, cleaning and cooking. This water is stored in a fresh water tank or drawn from the campground faucet and heated with an on-board water heater when needed. Once the fresh water is used, it becomes grey water and is stored in a separate waste tank. “Dry camping” is camping without hookups. It is also called“boondocking”—since many times you are camped out in the boondocks. When you dry camp, you rely on your RVs self-contained features like a 12-volt battery, propane, fresh water storage, on board refrigeration, toilet, and waste holding tanks. Factors that limit your length of stay include water and electrical usage and your holding tank capacity. How do I operate and maintain my RV awning? Most RVs are equipped with a canopy awning to provide shade and shelter. Some awnings you extend or retract by hand. Others you operate with the push of a button. Modern RV awnings are woven from synthetic materials like vinyl or acrylic. They are resistant to the elements and last for years. However, they require reasonable care and maintenance. How does the plumbing system work in an RV? The plumbing system in your RV is a lot like the plumbing in your house, but with some crucial differences. 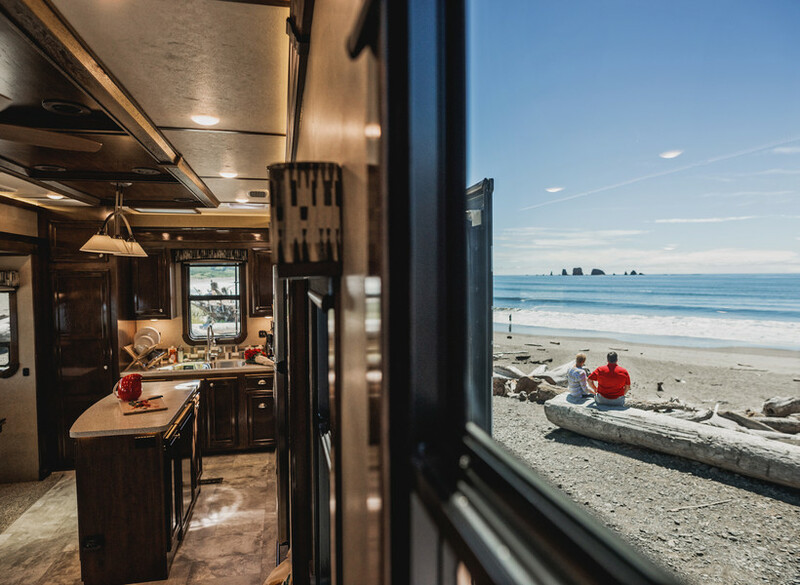 Hidden under your RVs skin, you’ll find additional technology that makes it easy for you to enjoy hot and cold running water, shower, and toilet facilities even when you are not hooked up. Here is some of the equipment that makes that possible.